"Schulman interestingly and insightfully raises a number of liberty-related issues that we ignore at the nation's peril. His ideas are precisely those that helped make our country the destination of those seeking liberty. The book's title says it all: personal responsibility, not laws and prohibitions, is the mark of a civil society." to control your own life? Not just any writer could begin to answer so profound a question but J. Neil Schulman has already won some pretty impressive fans for his previous books, including A Clockwork Orange author Anthony Burgess, Nobel laureate Milton Friedman, science-fiction grandmaster Robert A. Heinlein, and Academy-Award-winner, Charlton Heston. 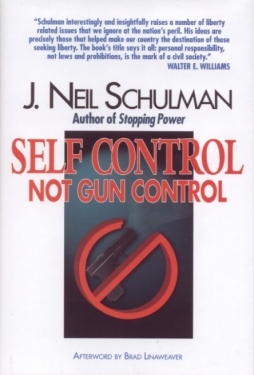 Self Control Not Gun Control is J. Neil Schulman's magnum opus on both current controversies and timeless questions, and he hits whatever he targets with magnum force, whether it's guns, revolution, New Age thinking, liberal hate speech, his vision of the coming Golden Age, or a few hundred words which give us "The Meaning of Life." Schulman explains how to find out if God exists. He shows why America's two major parties are the Mommy Party and the Daddy Party. He explains why guns are at the forefront of America's culture wars. 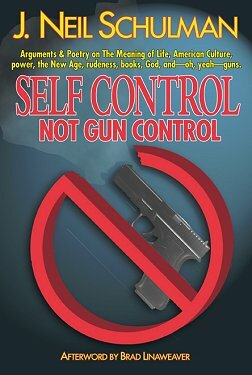 With wit and insight, this book shows that "if you can not, may not, or do not exercise the power to control your own life, someone else must and will." "I kept wanting to share this essay or that poem with someone who would get the same sense of confirmation I had." "This book is an expression of Mr. Schulman's philosophy of life as it relates to everything from God and religion to the O.J. trial, with lots of stops in between. I've been a fan of J. Neil Schulman's since I first read Alongside Night a dozen years ago, so it was fascinating for me to get a look inside his head and read his personal beliefs without them being "filtered" through his characters." "You've got to love this guy. Or at least admire and respect his courage in this era when our President equates patriotism with terrorism. In Old America, you'd be considered a patriot if you vowed to overthrow a government that degenerated into a tyranny. Today, Schulman's statement to that effect probably earned him a slot in a government "dangerous persons" file." Fill out form with your name and shipping address. If Self Control Not Gun Control is not everything that we say it is and you are not completely satisfied with it, then we will refund every penny of your money with no questions asked. Page for Page like the Trade Paperback Edition! The World According to J. Neil Schulman.